When Joey Cale is almost knocked down by a car, he finds himself alone in a world which is familiar but also ominously different. Can he overcome the odds and the threat of the terrifying Screamers to find his way home, or is he doomed to be lost forever amongst The Missing? The first book in an exciting new trilogy. 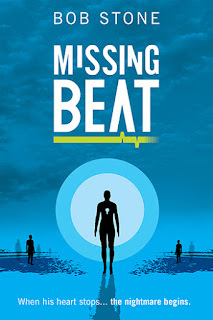 I am so far behind with my editor's reviews, as in...it's nearly two months since Bob Stone's debut novel Missing Beat was released and I'm only just getting around to writing this. On the plus side, Bob's written a short story in the intervening time, which means once you've read Missing Beat (and in a moment I'll tell you why you should), you'll get to read more about enigmatic Remick, who's a secondary character in Missing Beat but integral. Before I get to the book itself, I need to say a little more about the author. I've known Bob Stone in passing for several years (I've lost count, but about five, I think). Ours is a relationship structured around bookshops and, by extension, books, but it's only in the past year or so I've come to realise Bob is an incredibly special and important man - the kind all indie authors need on their side. His bookshop - Write Blend - is the sort of place we all dream of: books downstairs and a big meeting space for signings and other authorly events; a coffee shop upstairs, which serves great coffee. Many of the books on the shelves are by indie authors, and while I'm pretty sure Bob does it for the same reason I do what I do (love of books, lest there's any doubt), I'm 100% sure he'd welcome your custom if you happen to be in the Crosby (Liverpool) area at any point. Which leads me to Missing Beat. 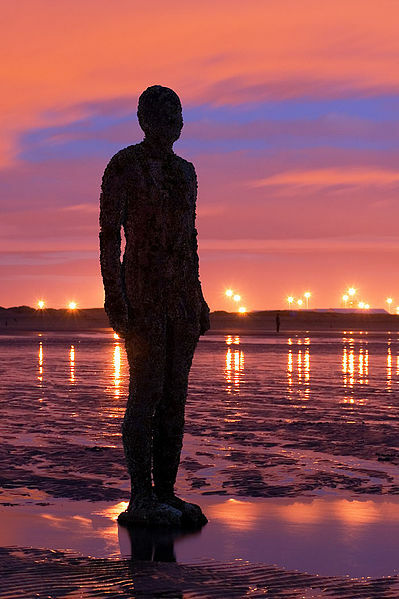 You might notice that on the cover (designed by the incredibly talented Trevor Howarth) there are people and water: a stylised depiction of Crosby beach where there is a collection of statues known colloquially as the Iron Men (officially 'Another Place' by Antony Gormley). These statues also play an integral role in Missing Beat, but I'll say no more on't. Well, no more than saying how much I love books that feature a place I know quite well (the North West of England) but take me on a brand-new journey so that I see it in an entirely new light. That's the preamble, really. The story itself is young adult (as Bob suggests, this means young adult and upwards in age - adult readers will enjoy this story just as much), and the protagonist, Joey, is a young man whose exam results day takes a bizarre turn when he's almost knocked down by a car and ends up alone in the world. Except it's not quite his world. Everything is slightly off and slightly scarier than before. The Screamers are, bluntly, terrifying, but far from the only threat to Joey's survival. Nor is he quite alone. However, we, the readers, are as much in the dark as Joey when it comes to distinguishing friend from foe. Ultimately, Joey's sole aim is to get back home, but, of course, it's a little more complicated than that, and Joey is a little more important than he believes. A reluctant hero - imperfect, afraid, humble - absolutely the kind of guy you want on your side. That's about as much as I can write about the story without giving away the central plot and its many twists and turns. What's different about Missing Beat? After all, there have been some very high profile British YA novels with a reluctant hero who, along with his friends, saves the world. Well, there are a few things. First of all, Joey isn't magical or gifted or anything like that. He's just an ordinary sixth-former with plans to go to university and that's about all. He also has a disability - nothing spectacular. He's no mystical savant. It's a physical condition, and he just gets on with it. Finally, Joey and his crew are from Liverpool (or thereabouts). 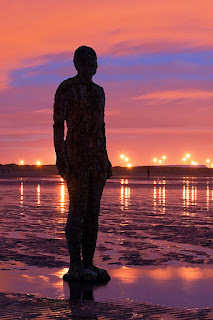 No doubt, there are other fine YA novels out there set in Liverpool, but it's not those that make it onto the screen. Missing Beat is a YA fantasy novel, published 7th June, 2018. Paperback and ebook editions available from all the usual outlets. Book one of a trilogy. Also available: Out of Season: a novella. Liverpool born Bob Stone is an author and bookshop owner. He has been writing for as long as he could hold a pen and some would say his handwriting has never improved. He is the author of two self-published children's books, A Bushy Tale and A Bushy Tale: The Brush Off. Missing Beat, the first in a trilogy for Young Adults, is his first full-length novel. Bob still lives in Liverpool with his wife and cat and sees no reason to change any of that.